Persistent infectious stimuli initiate and sustain the fibrotic process. Pathogens such as bacteria, viruses, fungi, and multicellular parasites represent major tissue injurious signals. The host response, mediated by the innate immune system, is intricately directed toward recognizing PAMPs through a myriad of PRRs. 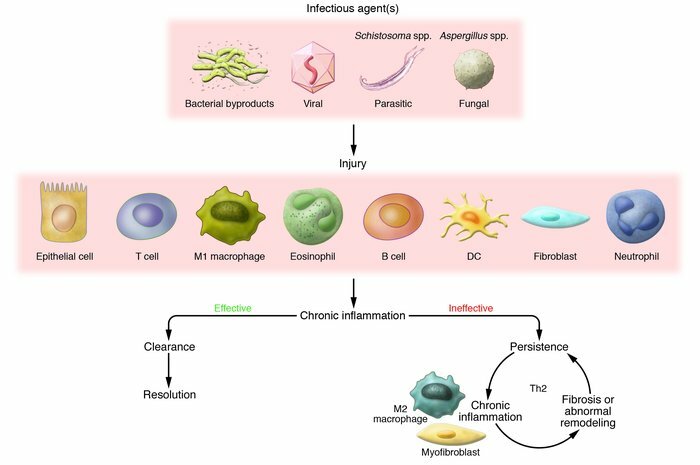 The concerted inflammatory and immune efforts of several immune and nonimmune cell types, including (but not limited to) classically activated macrophages (M1 macrophages), T cells, eosinophils, B cells, DCs, neutrophils, epithelial cells, and fibroblasts, contribute to the chronic inflammatory response. A dominant Th1 cytokine response normally characterizes an effective immune response against most pathogens, except most multicellular and extracellular parasites. Should pathogens and their byproducts be effectively cleared, the affected tissue often heals appropriately and the inflammatory process resolves. However, pathogens use various survival strategies to avoid elimination, and this leads to their persistence or the persistence of their byproducts in the host. The cytokine pattern associated with the ineffective response is often skewed toward the Th2 cytokine pattern. The resulting fibrotic response might be a consequence of the actions of unique cells such as the ECM component–synthesizing myofibroblast and the alternatively activated macrophage (M2 macrophage). The fibrotic response, in turn, might facilitate the persistence of pathogens and their byproducts, thereby allowing this vicious cycle to continue.